Designed for use with our Hand Tacker, these Tacker Staples are provided in a sizeable box of 5000. Useful for stapling documents to sturdy backgrounds such as display boards, these high-quality 13/6mm galvanised staples securely hold documents with ease and do so subtly so as not to distract the eye from important information. 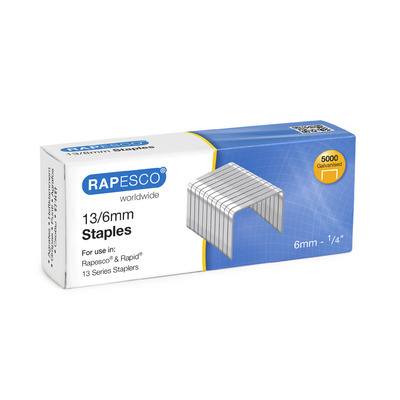 A useful addition to any stationery cupboard and ideal for high-traffic environments where multiple documents need to be displayed on a regular basis, this large pack of tacker staples mean you'll never be left without the equipment to complete the job at hand. Add our Hand Tacker to your basket today and get on with displaying those important documents. And for offices with high levels of print, our large A4 Paper Packs slip easily into your storage cupboard for those top up moments.